If my ancestral history is correct, great-great grandfather Ragle was drowned in American port when the small boat from ship to shore capsized. Although he never touched American soil, Elizabeth, the widow of this German immigrant, gave birth a few months later to their only child, Martin Hagia Ragle, in 1804 in Virginia. Years later in Alabama, Martin and Parthenia Parker were married. 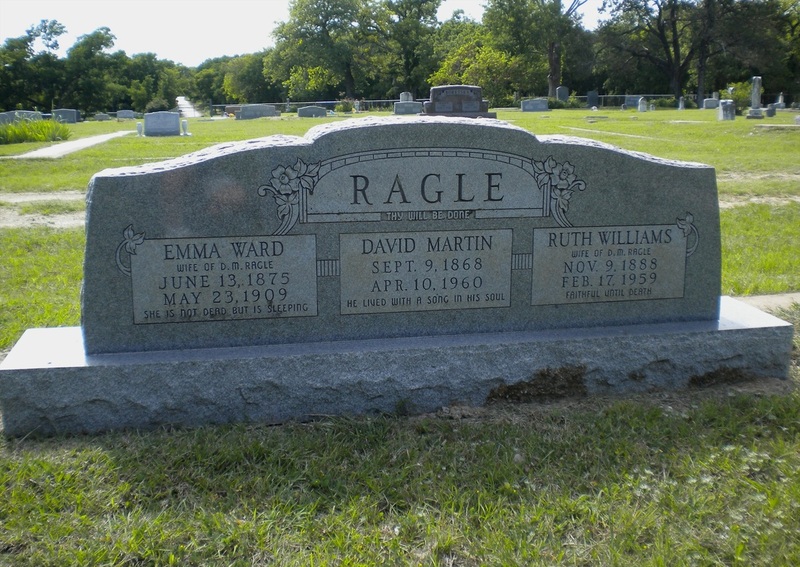 One of their eleven children, George Washington Ragle, was my grandfather. George grew up and married Elizabeth Craig. David Martin (D.M.) 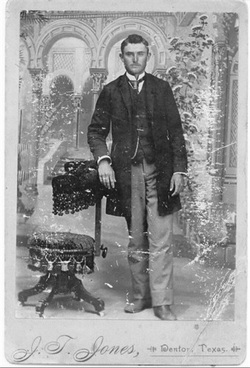 born in 1868, one of their six children, was my father. When David grew to young manhood he, with his father, George, and other relatives migrated from Alabama to Parker County, Texas. David was a farmer. After his marriage to Emma Ward they lived in several communities but all eight children were born in Parker County. The last two, Bessie and Lorene, were born in a two-story house on the Zion Hill Road about two miles from Weatherford (this house is still inhabited, but has been enlarged and modernized). About 1916 the family moved to Weatherford to be nearer to schools, but by early 1918 David had bought a farm in the Dicey community and the family moved there. Soon after this move, David married – this time to Ruth Williams, who soon learned to bake stacks of cornbread, and large amounts of other foods, including a wash pot full of hominy so there was plenty to can for future use. Hog killing time during cold weather, gardening and canning vegetables, as well as home grown beef in the summer and other farm chores kept everyone busy. David wanted to improve crop production. He rotated crops and was among the first to terrace his fields to prevent soil erosion. But his avocation was music. He loved to sing and to teach others to sing. He wrote many hymns and other songs and made a practice of attending singing conventions. Two of David’s eight children left this area early in their lives. Some information on these two will be given here. The other six of the children have their own sections elsewhere in this book (History of Parker County; published 1980). Ward enlisted in the Air Force Reserve soon after the move to Dicey. He was sent to Hawaii for his enlistment period. After his release, he settled in California where he married Marian Reigelman in 1929. They parented twin daughters, Shirley and Joyce, then Betty. The family lived in the Sacramento area. Ward died in April 1979. Pearl was away teaching for several years before she met and married Hubert Patterson of Oklahoma in 1928. They moved to Cimarron, New Mexico where they reared Bert, Bob, Ed, John, and Mary. All the children have their own grown up families, except Bert who was drowned during military service. Hubert died about 1963. Several years later Pearl moved from Camarron to Albuquerque to be near Ed and John. Between 1930 and 1940 many holidays and birthdays were celebrated at our Dicey home. Those of us who lived near enough to attend were always invited. On very rare occasions Ward came from California with his wife and children and Pearl with her husband and their children – then all eight children were together. These were good times. By about 1946 David and Ruth gave up country living to move to Weatherford. They continued to have holiday and birthday get-togethers. Ruth died suddenly in February 1959 after being a good and faithful helpmate for 41 years. David’s health had not been good for several years; he died in April 1960. The stories of the other six children, as mentioned earlier, are elsewhere in this volume. These six are Lela, Reuben Lee, Tom, Bessie and Lorene.